Southern California is having a great wildflower year but is it really a superbloom? "The term ‘superbloom’ is a media construct with no botanical or ecological origin,” said Cameron Barrows, an associate research ecologist at UC Riverside’s Center for Conservation Biology. To Minnich, a superbloom happens once in a generation, like the legendary flower explosion Death Valley and the Coachella Valley experienced in 2005. Barrows remembers 1991, when scientists, not the media, talked about the “March Miracle” in the Coachella Valley. But both researchers agree 2019 is shaping up to be a very good wildflower year, especially in the desert, and it’s worth the effort to get out and see it. “Cooler weather has kept the bloom going much longer than is typical,” Barrows said. The Southern California deserts do not get enough rain to support more than a sparse growth of hardy, uniquely adapted shrubs and cacti. Some years there is only enough rain for patchy desert annuals, or plants that live just one year. Then there are those rare years with carpets of annuals comprising dozens of species. Barrows said this is one of those years. The slopes around Riverside are mixed. A few mountains near Lake Elsinore are thickly painted with color, but Lake Matthews and the Box Springs Mountains near UC Riverside sport more modest displays. “A wet year does not guarantee a lot of flowers because of invasive European annuals like the bromes,” Minnich said. Bromes include several species of grass collectively known as foxtails to most people. Bromes are aggressive and grow so fast in wet years, Minnich said they can swamp the ecosystem to where flowers virtually disappear. Bromes probably arrived in the ballast of ships from Europe entering San Francisco Bay during the Gold Rush. They appear in a few botanical collections as early as the 1860s and by the 1890s had spread so vigorously that botanists began to complain. By 1940, no wildflowers were being recorded in the Los Angeles area. The brome invasion took longer to reach the Inland Empire. “In the last 20 years we’ve had a lot of dry years and these grasses actually crash. They germinate and don’t even reach reproductive maturity because there’s trivial rainfall. You get rid of the parent generation and there’s no seed produced. You can rapidly thin them out,” Minnich said. Brome seeds only last about a year or two in the soil. Wildflower seeds can survive decades or longer, outlasting the bromes and bursting to life in wet years. Wildflowers and bromes dance a deadly tango, with bromes taking the lead in wet years and wildflowers asserting themselves after dry years. The same droughts that killed whole forests have, paradoxically, given Southern California’s wildflowers a new lease. On north-facing slopes, which tend to be cooler and moister, bromes still outcompete flowers. But on the south-facing slopes, which are hotter and drier, especially in dry years, native flowers abound. One such slope is the south side of Picnic Hill, on the UC Riverside campus. Minnich has been taking his Geo 169 class to Picnic Hill and, after years of finding mostly brome and other invasive species like mustard, the drought and wet winter have brought forth a lavish crop of bluebells. Patches of dark purple can be seen on the hills around Riverside. The return of native wildflowers isn’t just beautiful. Wildflowers play a critical role in maintaining a diverse ecosystem and healthy populations of birds and insects. “The reason invasive grasses are disdained is that they are wind pollinated and so do not support the diverse community of native pollinators like bees and butterflies,” Barrows said. “One thing that sets California apart from the rest of the world is that we have one of the highest bee diversities of any place known,” said Doug Yanega, a senior museum scientist at UCR’s entomology museum and an expert on bees. California has over 1,600 species of bees. 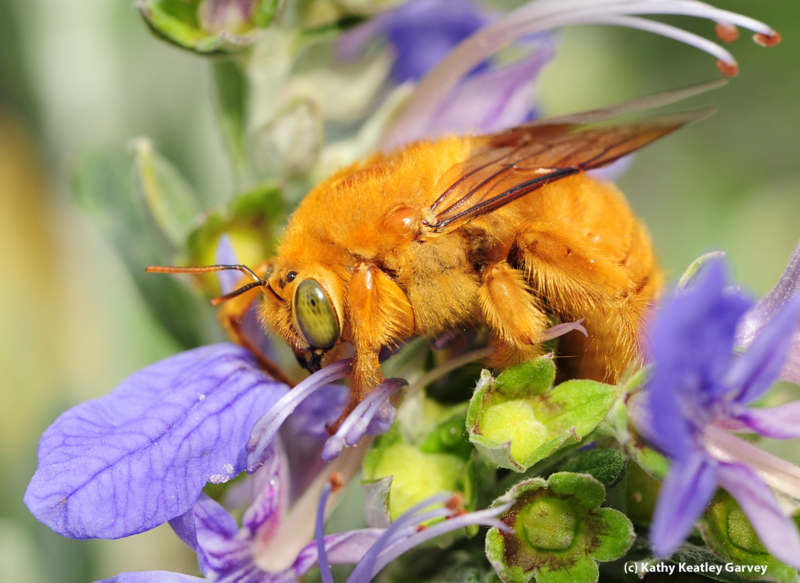 Within a 50-mile radius of Riverside, there are about 500 native bee species, Yanega said. Most of those are in the Coachella Valley. Yanega said that most species of bees feed only on one genus of plants, sometimes only one species. Deserts are high in bee diversity because they are high in plant diversity, though only for a small portion of the year. A tight relationship exists between the annual bloom and bee populations. The majority of California’s native bees are solitary. Most nest in the ground. Bees collect pollen and nectar from flowers to deposit in a cell where they lay an egg. After the egg hatches the larva eats the pollen and nectar, then pupates and usually emerges as an adult bee the following year. “Bees need a consistent supply of flowering plants across years in order to build up their populations. You can’t just have a one-off good year. You need consistent good years because if the bees make a bunch of offspring this year and next year there aren’t enough flowers to support them, it doesn’t matter that they made all these offspring this year,” said Hollis Woodard, an assistant professor of entomology at UC Riverside who studies bumblebees and other native bees. “There are tons of specialist bee species out here in the desert. Collectively, they’re dependent on flowering plant abundance and diversity and they need it through multiple years to really have stable successful populations,” she said. 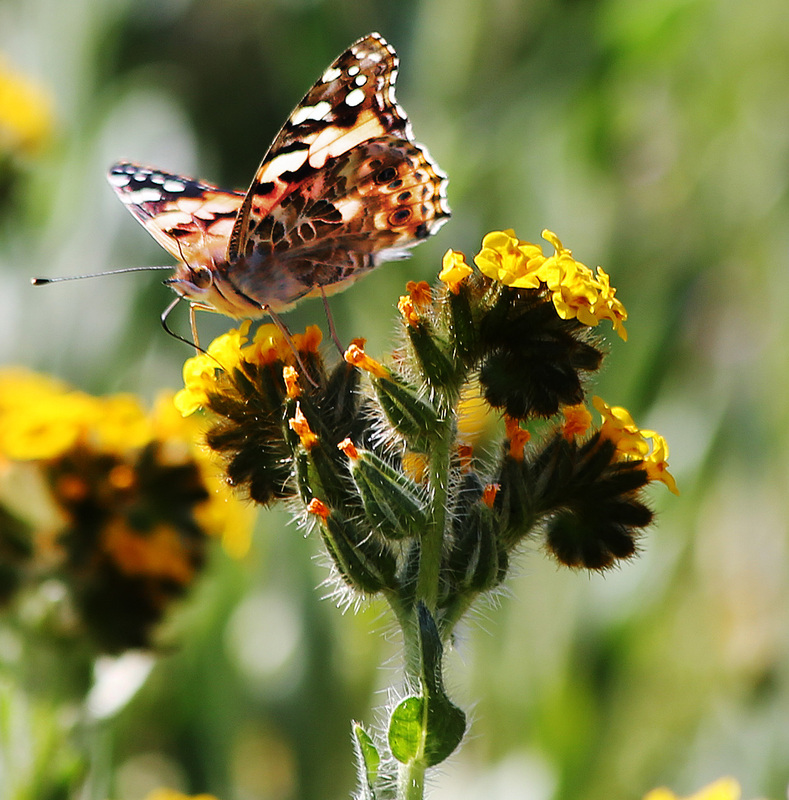 Because the rains that drenched California all winter didn’t stop at the border, the Mexican desert is also having a terrific wildflower year, allowing its permanent population of painted lady butterflies to breed by the millions. Some follow the bloom northward, delighting Californians (and butterfly-eating birds) with their colorful swarms. Thanks in part to native wildflowers, California supports five resident species of hummingbirds that play important roles as pollinators, and even more that migrate through the state seasonally. “Hummingbirds need access to a constant source of nectar all year round, so they don’t necessarily rely just on the wildflowers, but they definitely benefit from them,” said Erin Wilson Rankin, a UCR assistant professor of entomology who studies pollinators and the effects of invasive species on food webs. Hummingbirds that defend excellent food resources may be more likely to mate and Rankin thinks the superbloom could lead to a more successful breeding season. She said that tiny flies and midges are attracted to native flowers and become an important source of protein that females need to produce eggs. With such abundant food, we could see a lot more hummingbirds this year. “Without the native wildflowers showing up episodically, the biodiversity of bees and butterflies would rapidly erode. Weeds and other non-natives are no substitute for the rich diversity of annual wildflowers,” Barrows said. 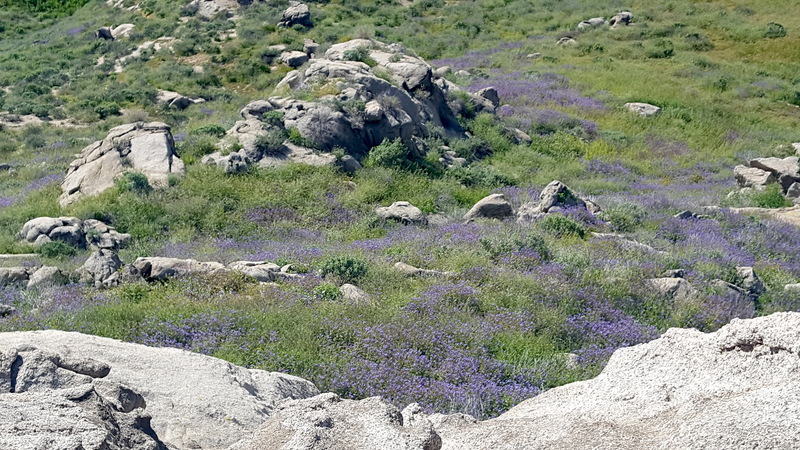 Whether or not the 2019 wildflower season is shaping up to be one for the record books, the splendid colors coating the Inland Empire’s slopes and dunes reflect a cornucopia that in drier years is easy to overlook. “In general, people are quick to dismiss deserts as wastelands,” Barrows said. • Don’t pick or damage any flowers. • Stay on maintained trails. Avoid trails made by people walking into the flowers. • Don’t park your car, walk, sit, or lay down in the flowers. • Keep dogs leashed, away from flowers. Don’t let them dig or run around. • Pick up your trash— Don’t litter. • Keep a respectful distance from wild animals and don’t feed or annoy them.